Damask is favourite fabric for period home interior decor as its history covers many centuries, but just what is Damask fabric? Our association with Damask being an opulent, luxurious fabric goes back to the 12th century when western traders were first able to purchase it in Damascus, a major trading centre in the silk route, but the weave itself is much older. The invention of the Jacquard Loom at the beginning of the ninetieth century meant that Damask could be mass produced and its use in soft furnishing more widespread. Changing the soft furnishings is a great way to give a room a new look without the expense of new furniture or the hassle of painting. Limoges, pictured above, by Northcroft Fabrics took its inspiration from the traditional French patterned damasks and has a soil-resist finish. 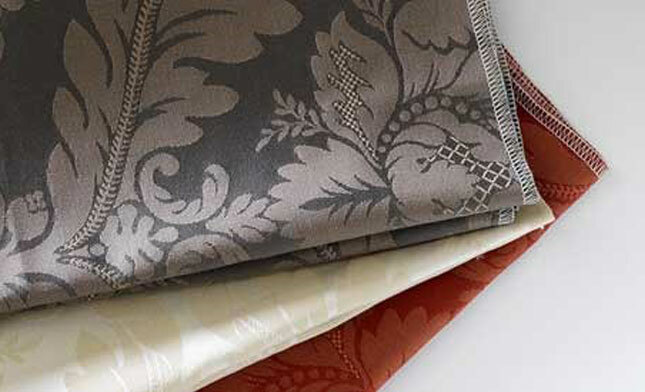 The fabric company has also just launched a Damask material based on an elegant 18th century Italian design. Suitable for both upholstery and curtains with a pattern that repeats at 57cms and a width of 140cms, Stamford also has a co-ordinating stripe fabric, Stour.